She woke with a start, jolted from dreams of a better life in a better place and reached to silence the 5.30 alarm. The rays of an early June sun embroidered diamonds in the moth holes of the faded curtains as she laced her trainers and slipped down to the deserted street for her morning run. Matt, her adored partner for three years, aspiring musician and international artist, snored on. ‘He dreams when he’s awake too’, she thought. By any measure, Sarah Farr was a stunning woman. Tall and elegant, with piercing blue eyes and a vast mop of unruly blond curls. If you met Sarah, you remembered the moment. Just 28, she’d risen rapidly to become events manager for a national charity. She ran marathons, took yoga classes and, to her parents’ dismay, had once cycled alone across India. But Sarah’s plans were now built around her life with Matt, a cottage in the country, a gurgling stream and a bluebell wood, a wet-nosed Labrador curled by a log fire and maybe, even children. In their draughty, rented flat she’d already started gathering the nic nacs and furnishings which one day would fill their home. They shared a passion for Victoriana and most weekends would return from foraging, laden with yet another haul of stripped pine, copper pans and china dolls. ‘Where is it?’ he asked, his knife scouring the Bovril jar without success. ‘Looks really interesting. You know … toys, pots, pictures.’ She paused, remembering. ‘There’s this lovely painting in the window, of an old Georgian house set in lawns, with a stream.’ They day-dreamed over a second coffee before she pulled herself away and dressed for work. ‘Don’t be late!’ he called from the landing, as she clattered down to the front door. ‘Chris and Emma are coming at six.’ But she’d gone. ‘Mornin’ Sarah, nice scarf!’ called Bernie, as she passed the cheeky grocer’s open door on her way to the Portobello Road. ‘Hi Bernie,’ she sang back, amused and pleased too, at finally being accepted as a ‘local’. And the route to work was so familiar. The antique jewellers, the book shop run by a tattooed dwarf, Paavak’s grinning face behind heaps of exotic vegetables, now the wretched Poundland and then her new discovery, ‘My Possessions’. ‘I’m afraid I’ll have to ask for five pounds,’ he replied, hands clasped nervously in front of his apron. Sarah was stunned. It was a beautiful picture, of a grand Georgian mansion whose rows of huge, empty windows gazed out onto a manicured lawn. Matt’s mobile rang at 11.30. It was Sarah’s office. They asked if she was sick as she hadn’t turned up for work. He ended the call quickly, his mouth dry, heart thumping. Sarah was never ill. He called her mobile and, for just a moment, was relieved to hear the familiar, cheery voice but it was only a message. ‘Sarah – where are you, what’s happened?’ The questions tumbled from him. ‘Please, just call me!’ He ended the call, pulled on trainers and dashed from the flat. He knew the route she usually took and within minutes had run the half mile to the Portobello Road. A voice within urged him to stay calm. She’d stopped to see a friend and had forgotten to call her office, her old migraine had returned and she was sitting quietly somewhere, the park maybe? He stopped to call Emma, her closest girlfriend. She hadn’t heard from her since Monday and from Matt’s quivering voice, she too grew worried. He turned into the bustling street, his heart racing, peering anxiously into every window. Passing Poundland, he recalled Sarah’s comment about the painting in the adjacent shop. He stopped. It was not ‘My Possessions’ but a grubby tattoo parlour. He ran back fifty yards and returned, this time more slowly, but found not a single shop on either side that might have sold paintings. He fumbled desperately with his phone. She still wasn’t answering and no, her office hadn’t heard from her. He strode on. Of course, she’d been mistaken, he rationalised, the shop must be further on. By the time he reached the end of the road, a desperate panic had gripped him. He called the police. To Matt’s frustration and bewilderment, it was an agonising three days before the police finally took her disappearance and his repeated calls seriously and came to the flat. An unsmiling male sergeant in his thirties stepped into the dingy hall, shadowed by a small blonde female cadet, who to Matt appeared to be barely out of school. The procedure and the pedantry maddened him. He wanted them out searching for Sarah, they wanted to know if they’d had a row. Well not a row but, yes, they’d argued over something petty a couple of days ago. Had she ever moved out during their relationship? Well, just the once, but not for long. Were any clothes or a suitcase missing, was her passport at the flat? Where did her friends and family live? The questions seemed to go on forever, his answers tediously transcribed with a stump of pencil gripped between plump red fingers. Phone numbers, addresses, details of friends and family … all logged. At last, the worn black notebook was closed and, armed with a creased photograph of a laughing girl in a running vest, they left. The officer’s clumsy reassurances that she would probably turn up in a day or two did nothing to reassure Matt, and neither did his promise to alert local patrols and newspapers. For Matt, the following days and nights were a waking nightmare. He ate little and slept fitfully on the faded old sofa, unable to even look at the bed, their bed. Calling her mobile became an obsession, as if repeatedly hearing her voice kept her closer to him. His own phone rang constantly, as family and friends struggled to understand what had happened to her, to this woman who cycled continents, and to offer their suggestions and support. Her parents drove down and booked into a local hotel, their well-intended but frantic presence of no real help to Matt. And then the Press got wind of the story, because for them that’s all it ever is. They camped outside the flat, called to him through the letterbox, mobbed him with inane questions whenever he dared venture out. After six days, her face was on national television and plastered across the tabloid rags. ‘Riddle of missing blonde’ they screamed. ‘Have you seen Sarah? Join our hunt’. And to Matt’s horror, after yet another police interview woven with innuendo, ‘Cops quiz Sarah’s lover’. The police finally launched an intensive investigation, interviewing hundreds of shop staff, customers and tradesmen. Bernie the grocer remembered that morning well. ‘She seemed ‘appy enough, but then she always was – is I mean. A little darlin’ that Sarah.’ Two shops down, helped by the translator, Paavak wiped the earth from his hands and confirmed that, yes, she’d passed by his store too. They gathered and scanned countless hours of CCTV, even re-enacting Sarah’s last known steps using a girl so similar in build and appearance that Matt couldn’t bear to watch. Later, ‘Crimewatch’ would feature the case and repeat the eleven, silent seconds of tape showing her striding towards Poundland on that sunny morning. But on the cameras further along there was no sign of her. Sarah Farr had vanished. The weeks passed and with them, all hope of finding the young woman slowly faded. Matt stood by every word he had uttered, even in the face of endless police questioning. He heard himself repeat again and again Sarah’s description of the shop with the painting in the window but even he eventually began to doubt his own memory. He was forced to accept the conclusion of the police that there had never been a shop called ‘My Possessions’. Crushed and unable to escape the shadow of suspicion that followed him everywhere, one morning in November he packed a small case and boarded the train home to his family in Preston. He spoke to no one during the trip, curled up in the window seat, headphones clamped to his ears. If anyone had been able to listen they would have heard not music, but an endless loop of a woman’s voicemail greeting as he flicked through the photos of her on his iPhone. Carrie Goldman, a young art student from Boston, arrived in London to start her course at the college in Chelsea. She was a fun-loving girl who now shared a basement flat with Linda, a career student in her mid-sixties and her three skeletal cats. Carrie was passionate about English landscapes and, as she skipped along the Portobello Road on her way to the station that wet Wednesday morning, something about the painting in a second-hand shop window stopped her in her tracks. 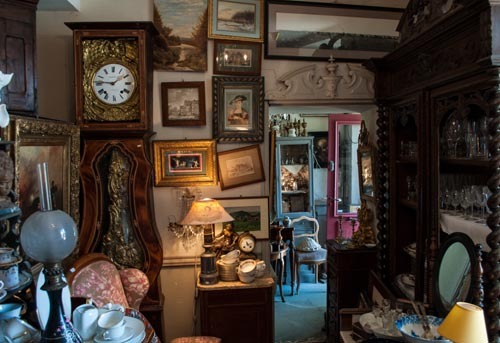 For once she was early and, on impulse, pushed open the old door and stepped down into the long, silent store, its walls filled to the beams with an astonishing array of unmarked antiques and paintings. Moving closer to examine the framed artwork, she became aware of chesty breathing behind her and swung round to find a small, curiously dressed man in a leather apron smiling up at her. For a second or two, neither spoke. ‘Are you looking for something in particular?’ he asked, his voice soft.